Is there any colour cartridges for the Ricoh Aficio 3025? Thanks. The Ricoh Aficio 3025 is a black and white photocopier so it doesn't accept colour cartridges. It can only use the genuine black Ricoh type 2220D toner listed on this page. Compact and very functional, the Ricoh Aficio 3025 makes the ideal choice for a designated monochrome printer and copier for the office. The Aficio 3025 printer uses twin laser scanning and high quality electro photographic printing when copying documents, which translate to very readable duplicates. The Ricoh Aficio 3025 black and white photocopier is also a reliable scanner and it supports various file formats. However, it only offers fax as an option along with wireless networking and Bluetooth connectivity. The Ricoh Aficio 3025 is a large printer-copier, but is still compact for its kind, measuring about 55x60x98 cm. It can handle various paper sizes from A6 to A3 and when it comes to connectivity, users have varied choices for speedy connection including a standard USB and Ethernet port. Firewire, bidirectional, Bluetooth, and WLAN interfaces are optional upgrades. The Ricoh Aficio 3025 laser printer even offers 384 MB of built in RAM and a 20 GB hard disk. The Ricoh Aficio 3025 mono laser printer is ideal for document management in almost any office environment. It is more compact than most multifunction copiers that offer the very same features like auto duplexing, document feeding, etc. The Ricoh 3025 copier printer can generate as many as 25 copies per minute, with high resolutions up to 600 dpi. Print rates are about the same while the scanner offers a maximum speed of 52 ipm. Scanned images can be saved as PDF, TIFF, and JPEG files. Installing a new Ricoh 3025 toner is a simple procedure that can easily be done by the user without the need to make a service call. 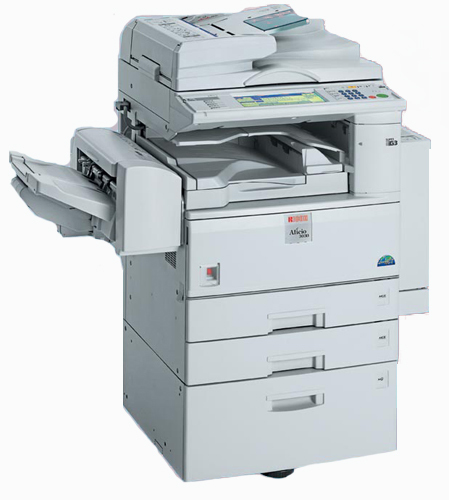 The Ricoh Aficio 3025 copier, however, does not offer fax as a standard feature. Users who need the fax option will have to spend extra for the upgrade, along with other optional add-ons like the extra paper trays and wireless interface.